← Mamas don’t let your babies grow up to wear baggy green BDU. As I continue to sift through the detritus of my past for interesting images, I found this. The ’66 Chevrolet 3/4 ton pickup was my restoration project in the mid-90’s. The truck had less than 90,000 miles when I bought it. Yeah, 90,000; it was a farm truck from up by Stockton, California. Still had the original owners manual and the yearly licence receipts and maintenance papers to show mileage. The old Chev needed paint, a few dents ironed out, new trim, replace the bed wood with white oak, replace the split rims with modern ones…added a tonneau cover for the bed and I had a nifty truck. The old beast had no rust; one advantage of spending its life in central California. Unfortunately, the original 283ci engine was a dog in this big, heavy vehicle; particularly since it was attached to a two-speed turbo-hydramatic. Ten mpg in town or on the highway. I considered dropping a modern 327 with a four- or five-speed manual in but had far too many other projects on hand…to include maintaining several motorcycles, a Mooney M20C airplane and a couple of beater Cessnas I was using to conduct flight instruction. I begrudgingly sold the Chevrolet. Wish I hadn’t but there were many vehicles I wish I would have kept. 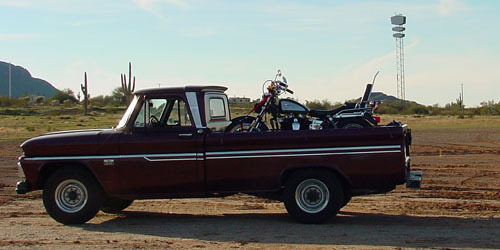 The ’74 Harley XLCH in the back of the pickup in this photo is not one of the keepers. I didn’t mind the kick starter; having owned many kick-start bikes, it’s really not a big deal if the machine is in tune and one knows how to use the starter properly. Not just this particular XLCH, either, though it had its own set of peculiar problems. I had owned other Sporties, all of which had their unlovable oddities. My first was a ’59 H. No pix, I was too young to know saving photos was worthwhile. At the time, all motorcycles had their eccentricities so the HD was no exception. The sucker liked to vapor lock in hot traffic. I was going to school in Phoenix, AZ, where it was always hot. I sold the beast. My second XLCH was a ’74 shown in the photo to your lower right. (The Datsun Z belonged to a girl friend.) The CH wasn’t fast; it merely sounded fast. Yes, it snorted, roared, snarled, popped…and any decent riceburner would run and hide from it in handling, braking or performance. That first ’74 was unlovable in many ways. It had a mind of its own when starting. If it didn’t want to start…it didn’t. Four kicks, no fire: go in and have another brew. That was OK occasionally but not as a matter of common practice. 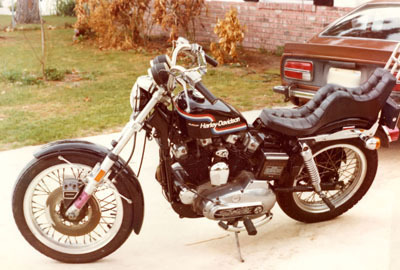 There were two great moments in the history of owning that first ’74 XLCH. The second best great moment was when I bought the bike; my great moment was when I sold it. Twenty years later when I bought the second Hardly-Ableson XLCH, I was trying to recapture those great moments of the ’70’s which, in reality, hadn’t been that great other than my being twenty years younger. What in the world possessed me to fork over $3000 for a motorcycle that looked all too much like a bike I had been so happy to get rid of? Several things. I had a hangar where I could work on the motorcycle, where I could maintain it in peak condition. I had several other motorcycles so I didn’t need to depend on the HD. I no longer imbibed so maybe the sucker wouldn’t strand me at a bar giving me an excuse to get knee-walking drunk.